To generate a RowMerge document, you need at least one document template attached to the table. Only table owners can add RowMerge templates. Or select the rows you want to include. If at least one row is selected, RowMerge will only process selected rows. Once you have decided which row(s) you want to include, click on RowMerge above the table, select a RowMerge Document Template and click on “Generate”. Once the job is done, a download link will be displayed. Click on My RowMerge History to browse your recent RowMerge jobs. 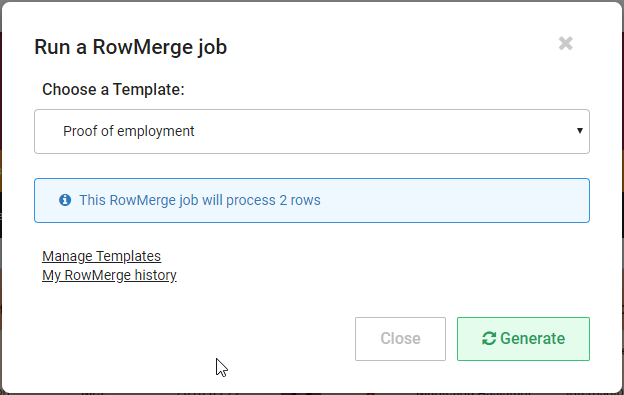 Your RowMerge History keeps jobs during 30 days for RowShare Business tables and 7 days for Free tables (in My Personal Tables) . 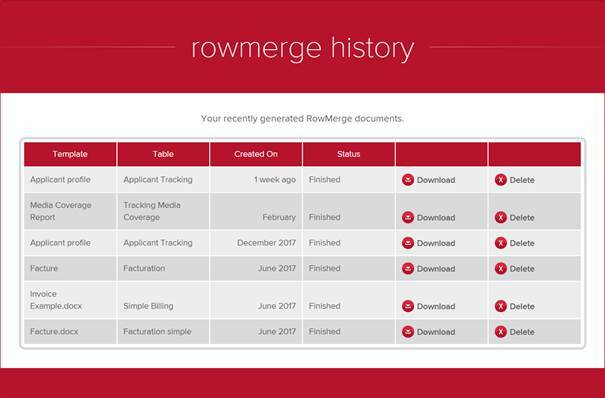 On this screen, you can monitor the progress of each RowMerge job, download your generated documents and delete it if needed.